Con la anuencia de Sabine Hyland, Hawansuyo hace nudo con su articulo sobre el kipu y su primer desiframiento como escritura fonetica hasta el momento. El articulo en su totalidad puede ser bajado e impreso aqui. Gracias al enlace puesto a disposicion del publico por Current Athropology de la University of Chicago. Chay ayniqa aswan allin. Van en aumento la investigacion en torno a las formas escriturales andinas, su huellas, archichuellas y poeticas originarias. No es pura coinciencia que recientemente Sylvia Falcon haya exibido un tokapu poema en sus presentaciones. Saludos Sabine. 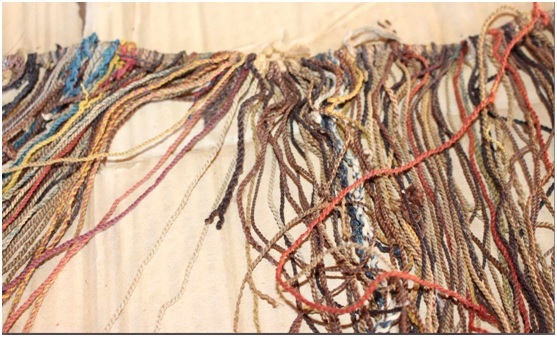 Colored pendants on Collata Khipu A. Photo by Sabine Hyland. 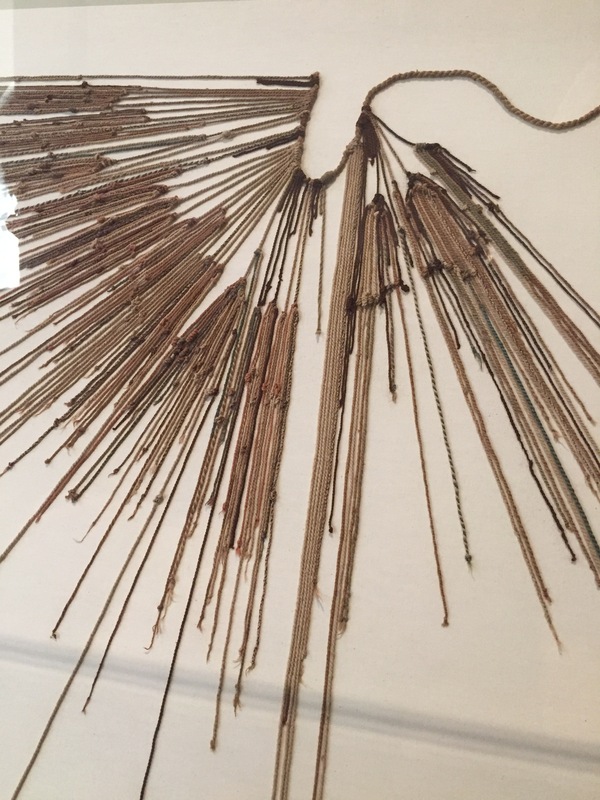 The Inka civilization of South America is known for having one of the most unique methods of writing and recordkeeping, which happened through the use of twisted and knotted colored cords known as khipus. The Inkas kept all of their records—for numerical accounts and for narratives —using khipus, and the khipus that have been preserved are one of the few ways scholars have to learn more about the Inka civilization. The problem for historians and anthropologists has been how to decipher the khipus that have been preserved. Although researchers have progressed in their understanding of khipus used for accounting, they have despaired of ever identifying and deciphering narrative khipus, despite the fact that Spanish witnesses claimed Inka era (1400 – 1532 CE) khipus encoded historical narratives, biographies and epistles. To date, no specific khipu has ever been reliably identified as a narrative text.